admin | Decor Interior Design Inc.
Every week as SmallBizLady, I conduct interviews with experts on my Twitter talk show #SmallBizChat. The show takes place every Wednesday on Twitter from 8-9 pm ET. This is excerpted from my recent interview with Ronda Jackson, @designsby_decor. Ronda Jackson, Founder and Chief Workplace Stylist of Decor Interior Design, Inc., is a true American success story. Born in a west-side Chicago project tenement as one of fifteen children, Ronda has overcome many hurdles. The savvy entrepreneur and single mother of two has successfully grown her small business into a multi-million-dollar firm that has been named within Fortune Magazine’s Top 100. You can learn more at http://www.designsbydecor.com/. SmallBizLady: What are some hurdles you’ve faced being a working, single mom? Ronda Jackson: My biggest hurdle is myself. As mothers we are in a constant giving mode, depleting ourselves day in and day out. I was seeking success at the expense of my health, relationships, and vitality. I have released unrealistic expectations of myself—realizing there is nothing to prove, it’s ok to ask for help, and it’s ok for a dirty dish to stay in the sink overnight. SmallBizLady: How do you balance work and family life? Ronda Jackson: Every 24 hours, moms are shifting and rotating priorities. I finally started reverse engineering my day. I reserve an hour a day for me, an hour a day for each of my sons and divide the rest amongst sleep, eat and work. SmallBizLady: How did running your business change after having kids? Ronda Jackson: My sons are my why; they are the catalyst of why I do what I do. Décor allows me to be the best mom possible. By taking really good care of both Décor and my boys…I’m living an entrepreneur’s dream. SmallBizLady: How do you find time for yourself between running a business and raising kids? Ronda Jackson: At the end of each day, I spend time nourishing and replenishing my mind, body, and spirit. I dedicate time every week to work on myself: reading, learning, growing, creating new experiences to keep my well full. SmallBizLady: How do you measure success? Ronda Jackson: I measure success by how many times I get back up, defeat uncertainty, and contend with rejection. I measure success in moments and remind myself that the small wins count too. SmallBizLady: How important is networking when growing a business? Ronda Jackson: The most valuable time, for me, is when I share my time and resources with other awesome like-minded people. They say who you spend time with is who you become. I surround myself with individuals who are committed to greatness, leadership and personal responsibility. SmallBizLady: What are some “best practices” that you’ve learned along the way? Ronda Jackson: I choose to laugh at myself and at life. Humility is my BFF. SmallBizLady: Do you feel that having a mentor is necessary when starting a business? Ronda Jackson: I am life’s apprentice. I study and learn from the people that have already figured out what I want to know. I have received and applied practical, smart, inspiring and empowering wisdom that has saved me years in business and millions in therapy. SmallBizLady: How do you overcome feelings of working-mom-guilt when you are pulled in so many different directions? Ronda Jackson: My 7-year-old son told me he needs 11 minutes a day of my time. The boys and I have a daily ritual of discussing the best part and worst part of our day. As long as I’m not on the worst part of their day list, then I’m feeling guilt-free. SmallBizLady: What is a typical day like as a CEO and mom? Ronda Jackson: I start my day pretty early. It keeps away the feeling of overwhelm. I try not to wear too many hats at the same time. Once I get the boys to school, my workday starts. My car is my mobile office; most of my day is ran from there. SmallBizLady: Do you feel that motherhood has made you an even better businesswoman? If so, how? Ronda Jackson: There are a lot of parallels between motherhood and business. The biggest thing that motherhood has taught me is to seek perspective. When parenting, you get down to your child’s level, create a safe place, and offer sage and appropriate advice. Priceless in the boardroom!!! SmallBizLady: What advice do you have for moms who are looking to start a business? Ronda Jackson: Be sure to select a business that compliments your desired lifestyle. Then build your business for the life you want, not for the life you have. They may be at the top of their game now, but these accomplished executives wish they would have heeded this early career advice. Our 20s are a time of tremendous career growth and learning. But this doesn’t come without some hurdles and hiccups, even if you ultimately end up as a successful professional or entrepreneur. We spoke to successful women about their own regrets in their 20s. Everything may happen for a reason, but if they could rewind time and change their approach, they could have fine-tuned their journey to the top. From taking advantage of having no strings attached and seeing the world to raising your hand and asking questions, here is the advice these women business owners wish they would have taken. In her 20s, Amanda Bradford, founder and CEO of The League, was busy. By the time she reached 29 in 2014, she was building her now uber-successful dating app. To date, The League has a 1.5 million person waitlist across 60 cities domestically and internationally, and has grown 100% year-over-year since its launch. Now 34, Bradford is happy with the success she’s found and the connections she’s been able to foster, but she wishes she would have taken the advice of her former boss at Google who urged her to go see the world. “Anyone who takes that leap of faith and moves abroad to continue education or work rarely regrets it. For me, global work experience and travel are key contributors to business and personal fulfillment. I wish I had invested more in global exposure during my 20s,” she says. I wish I had traveled and forged my own global experience in my 20s because now it’s just too hard. I’m devoted to The League and its rapid growth. As the app expands into international cities–already in London and Paris–it would be helpful to have firsthand knowledge of each market and a network of people on the ground. In a world that’s ripe with farm-to-table options, Suzanne Simon had a different idea: farm-to-taco. In 2013, she created Chaia Tacos in Washington, D.C., at the White House Farmer’s Market. At the time, First Lady Michelle Obama had launched the “Let’s Move” campaign, and it inspired Simon (and her business partner) to source local vegetables and develop seasonal recipes, honing in on sustainability and healthy eating. Though her 13-year-old daughter was skeptical of squash tacos, they’ve sold more than 1 million to date. I remember worrying about a project, and my sister said, ‘You know, you don’t have to solve every problem and know everything.’ If I had taken her advice at the time, I think I would have been more focused on solutions and would have gone into making mistakes with more confidence. It has taken me many years to learn to let go, accept mistakes, and realize that I can’t control everything. Take advice—and outsource. Much like not being able to ask questions, the best advice from Ali Grant, founder of Be Social PR, to twenty somethings is to, well, take advice. “I thought I could do it all and knew it all. Turns out, I didn’t. I made a lot of mistakes in leadership and large business decisions that ultimately caused a lot of unnecessary stress,” she continued. Even with early hurdles, now that she’s more than six years into business, her company has grown from barely hitting five figures to a multimillion-dollar business. And in the past year alone, she’s seen 51% growth. Hiring someone that specializes in bookkeeping is essential. Now, our accounting team is one of the most valuable parts of the business. You can’t know it all, especially at 24 years old. I wish I would have absorbed more advice from a strong mentor and other seasoned business leaders, so I could have avoided the mistakes I made. Change your attitude and you’ll change your income. I later learned that limiting beliefs inhibits your capacity, ambition, prosperity, relationships, health, quality of life, and ability to make a meaningful impact on the things you care about most. Looking back, it was a brief life lesson not about selling soap, but instead not letting your current circumstances get in the way of who you want to be. Her outlook definitely changed for the positive, since what once started as a one-woman show has grown into a multimillion-dollar firm that is in the Inc. 5000. When you’re such an overachiever that you decide to audition for American Gladiators on your wedding day, you know you’re the type of person who doesn’t slow down. After six weeks of filming, Ally Davidson became the Grand Champion but had to wait three months to spill the beans. She took that prize money and turned a lifelong dream into a reality, launching the first Camp Gladiator in Dallas. As the cofounder and co-CEO, Davidson’s brainchild is on track to exceed $60 million this year, and has an impressive 950 partner trainers that provide more than 4,000 locations across North Carolina, Louisiana, Tennessee, Texas, Colorado, and Florida. This equates to around 90,000 campers attending Camp Gladiator in any given month. When you’re constantly going at 100 mph, you will make mistakes and lose focus along the way. Every year, your priorities will continue to shift, and all of a sudden you don’t have the same time, energy, or focus you once had. But that’s okay. You have to learn to let the little things go, pick a few things to really focus on, and always make sure you have good harmony in your life to give yourself the breaks you deserve. I remember Sunday mornings, growing up on the west side of Chicago: the streets quiet, the air still, my grandfather’s pocket change jingling while he opened the doors to his church. Reverend Johnnie Jackson was a Baptist preacher — rousing, animated and moved by the spirit. Whatever your troubles were, Reverend Jackson preached, if you remained steadfast and trusted God, everything would be taken care of. I am very proud of the stability and hope that he and my grandmother offered the community. After moving away to Los Angeles in the mid-’90s, I enrolled in college and studied to become a pediatrician. I worked my way through school designing window displays for a home-goods store. One day a woman came in and told me that I was in the wrong business, that I needed to consider becoming an interior designer. Hesitant to abandon my dream of becoming a doctor, I took an introductory design class as an elective. I was hooked. It was a wonderful balance of science, art and ingenuity, and it spoke to my passion for helping people. I learned everything I could about the business, and in 1997, with help from a $100 Christmas gift, I opened my own firm, Decor Interior Design. A decade later, in 2007, a year after my grandfather passed away, I was home visiting my parents. My father, my uncle and I went over to his church. It had fallen into disrepair. When I say “fallen,” I mean it literally. The floor had caved in, so whatever had been in the church was now in the basement. As I scanned the room, I noticed a wooden acorn sticking out of a pile of wreckage. I couldn’t make out what it was. My uncle climbed down to investigate. It was my grandfather’s pulpit chair; a pair of them. We hoisted them up and out of the hole in the floor. They were mangled, barely standing. But they inspired an idea. At the time, I had been selected as a featured designer for the Beverly Hills Greystone Mansion showcase house. This was a big deal, an opportunity to demonstrate my talent to a wider audience. I believed the chairs could be a meaningful addition to my design. I packed and shipped those bad boys to California as fast as I could to have them restored, and I used them. They added such grace to the showcase, and I was proud to display a piece of my family’s legacy for the whole world to see. A native of Chicago, Illinois, Ronda Jackson is a third-generation entrepreneur, a mother, a licensed contractor, a certified interior designer, and no stranger to hard work. Ronda Jackson, IIDA, CID is the founder and Chief Workplace Stylist of Décor Interior Design, an award-winning commercial interior design firm. Despite the challenges of raising a family and growing a business, Ronda models the successful balance of both. I come from generations of women who embrace their individuality and push past barriers. The idea of owning my future and designing a life that allows me to pursue my passions seemed like the next best move. I seized the opportunity to investing everything I have in myself. I left my 9-to-5 to launch my business. It has been an amazing journey. For the past two decades, Décor has dynamically evolved into a commercial design firm specializing in workplace happiness. We deliver comprehensive design solutions that increase talent retention, optimize space utilization, and maximize productivity. I have been honored with the U.S. Chamber of Commerce Blue Ribbon Small Businesses Award, U.S. Small Businesses Administration’s Minority Small Business Champion, Black Business Association’s Outstanding Entrepreneur Award, and National Association of Minority Contractor’s Contractor of the Year. I also made Los Angeles Business Journal’s Top Minority Firms and Women Making a Difference Lists and earned a spot on the Inc. 5000’s list of the fastest-growing private companies in America, and Inner City 100’s fastest growing businesses. Décor is based in Los Angeles, CA with a design innovation lab in Canoga Park, CA. The first thing I did was run out and have business cards printed. No name or address, all the card said was Décor Interior Design with my cell phone number. I was soon to realize all the things I didn’t know about running a business. So, my real first step was finding a mentor. It gave me perspective on what it takes to run and manage a business. I have learned a lot by surrounding myself with successful people. 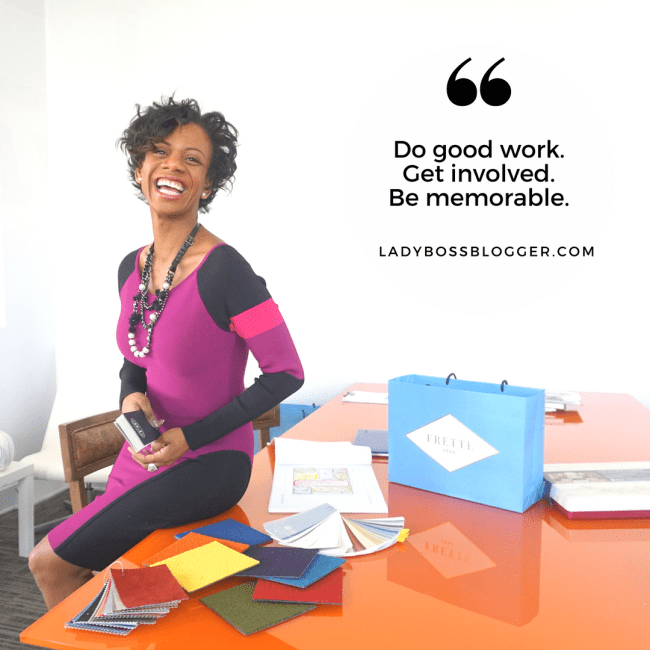 Do good work, get involved, be memorable. Second, build a community in your industry, peer groups, or mastermind. These are the people that not only become (potential) clients; more importantly, they are your cheerleaders and brand ambassadors. Finally, remember that people never forget how you make them feel. Owning a business is an ambitious endeavor—we know that. My biggest challenge has been me: developing the discipline and mental stamina to show up every day ready for whatever that day has in store. It was a process, and it is a journey that I am still on every day. I sought out the business training I lacked. Several education-based programs like Goldman Sachs 10,000 Small Businesses, Tuck-WBENC, UCLA Anderson, and University of Foster’s enhanced my knowledge in marketing, finance, and leadership. It taught me to step out of my role as interior designer, create milestones, and implement a strategic plan. One of the best decisions I made in my business was to fire myself. My new position allows me to be the visionary I was born to be. We can’t do it all on our own. To stay in this role, I had to build a team. I have a wonderful, supportive, knowledgeable, and agile team. My team knows I’m crazy, but they are willing to grow and learn with me. Instead of doing an ugly cry, I like to celebrate the small wins every chance I get. I remember my why: namely, that it’s not just about me. I think of my sons. I’m making a difference in the community—creating jobs. I am grateful for the opportunity to explore and engage in my entrepreneurial endeavors. What makes our firm unique is our integrated approach to design. We understand our planning and implementation impacts the way people feel. We think of our clients as partners and work closely to identify work habits and lifestyles. We listen to what clients want, and we reflect that. Every project is different, so we offer solutions that are as unique and individual as our clients. It was in a Robin Sharma article, “Live Fully Now.” The title alone, heightened my consciousness to stop holding back and make time for all the things I say are important, but never seem to get around to doing. It is a reminder that there is no better time than the present to do, be, give, have, see all the things I love. Be intentional about the way you live your life. I believe that when you are present and purposeful, you will be successful. Pen, paper, and a sense of humor are my favorite business tools. There is never a shortage of either. No battery to run out, I can always find the back of something to write an idea on. Laughter is like a reset button, life’s eraser. I believe in systems. I am currently investing in optimizing my operations via technology, process mapping, as well as client and talent retention. It’s really important to me to keep growing, learning, and evolving as a business owner and a business. A simple, inexpensive way to hide garbage cans is to put them behind landscaping buffers, such as tall bushes or shrubs. Few things on a residential property are as offensive to the eyes — as well as the nose — as a bunch of dirty, smelly garbage cans and lids strewn across the yard. Within close proximity of your backyard barbecue, swimming pool soirée or other outdoor gathering, unsightly rubbish receptacles can ruin the mood and create a bad first impression on guests. All the more reason to creatively camouflage these waste containers, according to the pros. Cayeiro said three options can accomplish your concealment goal: either screen-in your cans, place them in covered storage or use live landscaping buffers to hide them. A more secure and view-proof strategy is to purchase or construct a small enclosed shed or lean-to placed alongside the house or garage. This option completely hides the cans and prevents critters from infiltrating them and winds from blowing trash across the yard. “Ready-made, prebuilt rectangular structures have come a long way. They’re stylish and are available in many designs, materials and colors,” said Kristin Davidson, an interior designer in Texas. Building a custom garbage can shed can be a worthwhile investment, too. Justin Krzyston, principal founder Stonehurst Construction and Design, said his preferred concealment method of choice is Mother Nature. “Adding landscaping in the form of larger bushes is the easiest way to camouflage outdoor garbage bins. 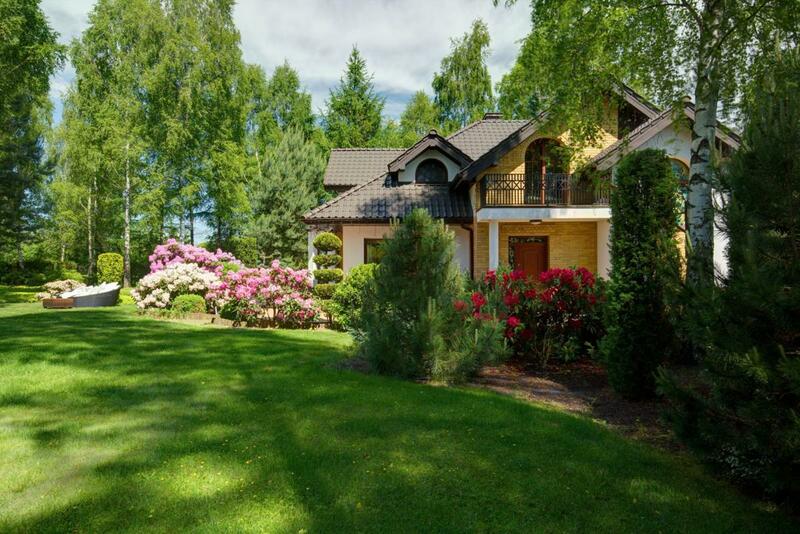 Plus, landscaping is always a good investment if you’re focused on selling your home down the road,” Krzyston said. Gillow recommends evergreens for the job. “You can plant taller and skinnier evergreens, such as arbs, hollies or boxwoods, which can create a natural fence to block views of garbage cans,” he said. 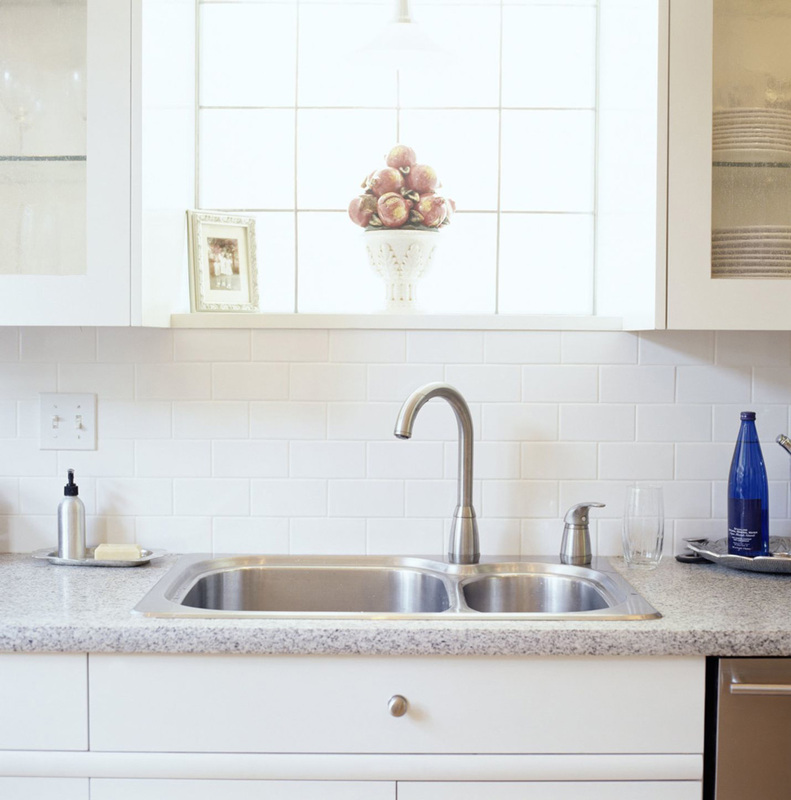 The best spot for a garbage can cover-up area is ideally not too far from where you take out the trash, yet not too close to windows or doors where the waste can be viewed or smelled. Avoid any spot that can be seen from the front of the house. Ronda Jackson, principal of Decor Interior Design in Los Angeles, suggests picking a location where you can hide other outdoor nuisances, as well. “If your space allows, look for opportunities to cover other unsightly things in that area, including mechanical and air-conditioning equipment,” said Jackson. 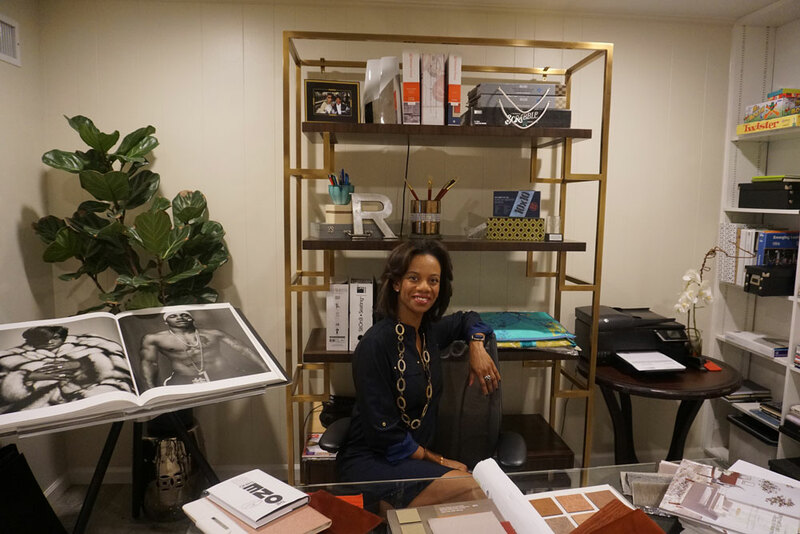 Ronda Jackson, the founder of Decor Interior Design. In the United States, many children live in single-parent households led by women. My two sons fit into that category, and I felt an overwhelming amount of guilt, pressure and shame that my sons weren’t growing up with a second parent in the home. I also felt the constant tug between being able to find the time and energy to raise my sons and provide for myself and them. 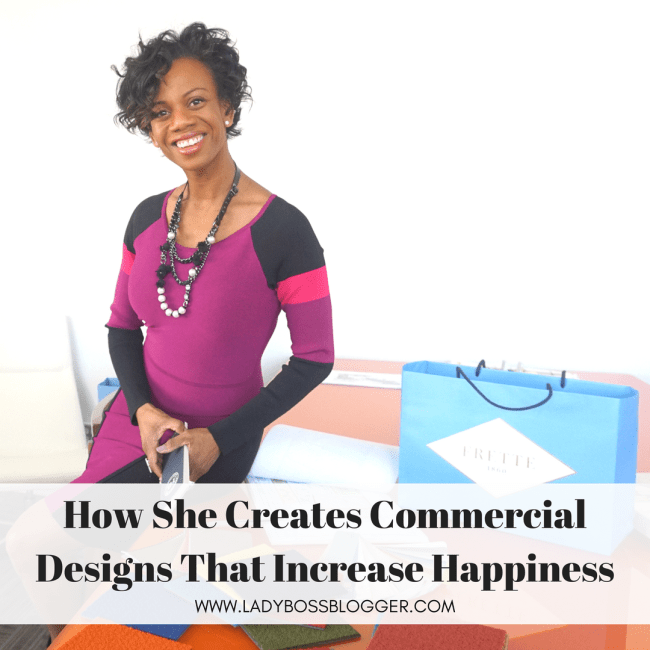 Finding the courage to build and grow my own business, a commercial design firm named Décor Interior Design, allowed me to conquer my financial strain and cure the social isolation that I felt as a single parent. Even though my parents were married and I grew up with a mother and a father in my home, I was born and raised in a project tenement on the west side of Chicago; I didn’t have a straight path to success. I went to college, got married, started working and soon I was expecting my first child. Before I could blink, I was getting a divorce. Suddenly, and unexpectedly, I became a single mom. It’s a reality I never imagined. My then five-year-old son, Jackson, asked me why his father and I were separating. I think I was speaking to the both of us when I told him, “That in order for any relationship to work, you both have to want the same thing.” I don’t blame either of us for not knowing what we wanted, but happily ever after we were not. Suddenly, and unexpectedly, I became a single mom. It’s a reality I never imagined. At the time, I had an amazing job with promise and potential, working for an international furniture manufacturer. In addition, I would take side jobs helping people decorate their homes and offices. I remember helping a client and picking up a check that was twice my monthly salary. I immediately realized the freedom and flexibility to not only write my own paycheck, but also to be in charge of my schedule and life. I left my full-time job to pursue entrepreneurship, and I launched Décor Interior Design. A room designed by Ronda Jackson of Decor Interior Design. By then, with my head barely above water, I had more time than money. I’ve always been fueled by the words “no,” “can’t,” “maybe,” and “not supposed to.” So even though my business and the businesses of my competitors were struggling, I persisted and began to read, learn, consume and implement everything I could in order to increase my revenue. I utilized local business development centers and the Small Business Administration to re-write my business plan. I enrolled in a variety of entrepreneurial programs such as Goldman Sachs’ 10,000 Small Business and UCLA’s Executive Education Program. I attended networking events five nights a week. I applied for every socio-economic diversity certification that applied to me. As fate would have it, the phone finally rang — someone did see my episode. It was a facility manager from Warner Bros., who invited me to her office to discuss a potential project. After designing and completing that project, I realized there was a huge opportunity for me to offer my services to corporations. With the best reference ever and project photos to prove it, Décor Interior Design began servicing Fortune 500 companies and the federal government. In addition to expanding our client base, we enhanced our breadth of products and services. This grew our revenue by 400% and our employee count quadrupled. I had worked tirelessly to make all of this happen, operating on an average of four hours of sleep for over 15 years, and sacrificing everything — including my marriage — to realize my goals. My sons, Jackson and Matthew, are a driving force and look to me as a dream maker and promise keeper. I plan to always deliver for them. As Décor grew, so did my circle of influence. I was able to build a community in my industry, form peer groups and become a leader in my field. These people are not only clients, but also mentors, cheerleaders, brand ambassadors and family. Ultimately, I realized my divorce only defined my marital status. Single, by my definition, does not mean alone. I became more resourceful and resilient after my divorce. As a single mom, I pushed the boundaries of family into a cohesive, creative and collaborative lifestyle. Be grateful for what you have, create opportunities and be fearless in the face of change. When I look back at my life and what I’ve accomplished, I am grateful for my family, my company and all the blessings I have received. I love to recount my unique and challenging experiences. I dwell on how they have shaped me and made me stronger. 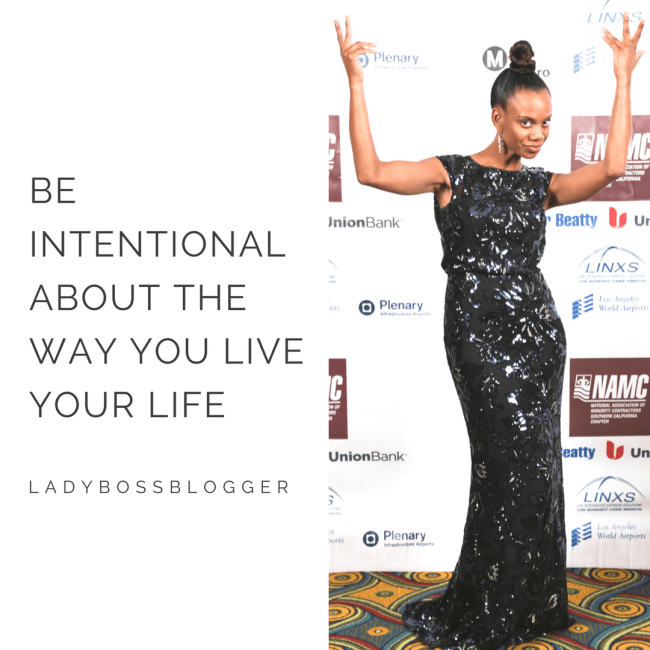 As I ambitiously develop and pursue my next steps, I want to stretch the narrative of my life beyond the confines of motherhood or business owner. I want my sons to see that they can do anything they want and that family always comes first. My mantra: Be grateful for what you have, create opportunities and be fearless in the face of change. Décor Interior Design specializes in tenant improvements and office furniture packages with an eye toward ergonomics, functionality, and esthetics. Customers range from Warner Brothers to the Department of Defense, and CEO Ronda Jackson takes particular pride in the family environment she’s created, as well as teaming up with other women, minority, and disabled-veteran owned small businesses. 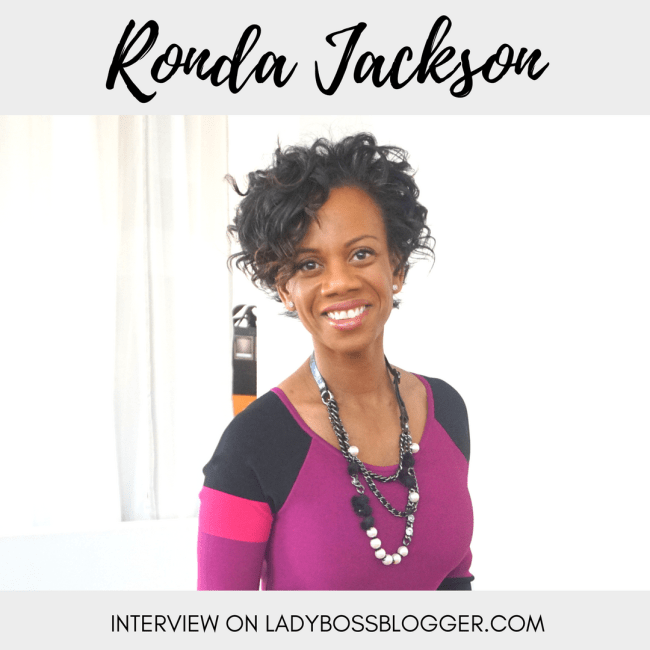 Native of Chicago, Illinois Ronda Jackson is a third generation entrepreneur, a mother, a licensed contractor, a certified interior designer and no stranger to hard work. Ronda formed Décor Interior Design at the desk of her day job in 1997 as a sole proprietor, and incorporated her business in 2006. Despite the challenges of raising a family and growing a business, Ronda models the successful balance of both. 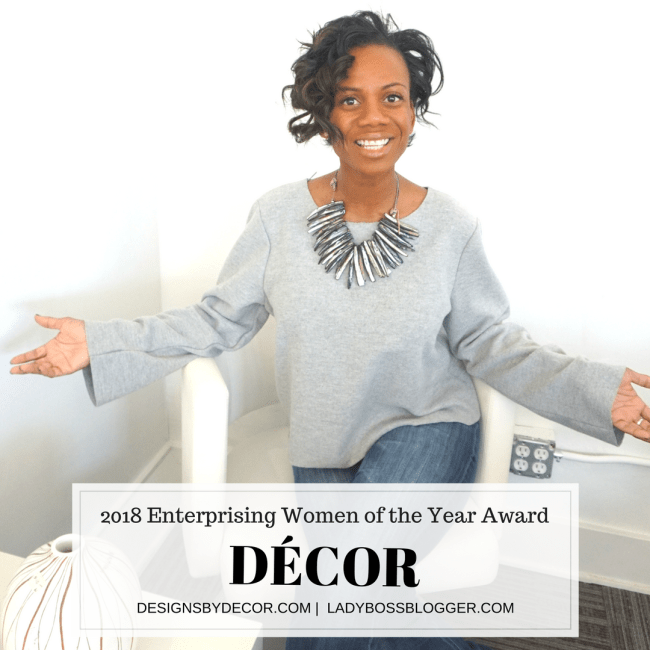 Led by Ronda Jackson, Décor Interior Design Inc. is a Los Angeles-based, SBA 8(a) certified, woman-owned facility resource company specializing in tenant improvements, interior support and grounds maintenance. In the early stages of her business, she operated as a soloprenuer from her bedroom closet. Her residential client list included doctors, lawyers, and vice presidents of Fortune 500 companies who embraced her work ethic and design talent. Unfortunately, good design and quality products were not enough to keep the company going over the course of sixteen years. To keep her business alive after the recession hit, Ronda had to convert Décor Interior Design from a boutique residential design firm. Her combination of skills and talents has afforded her the opportunity to expand her residential portfolio into corporate environments. She started taking on all kinds of work, from designing handicap-accessible bathrooms to office renovations, oncology clinics, interior and exterior painting; carpet care and construction clean up. 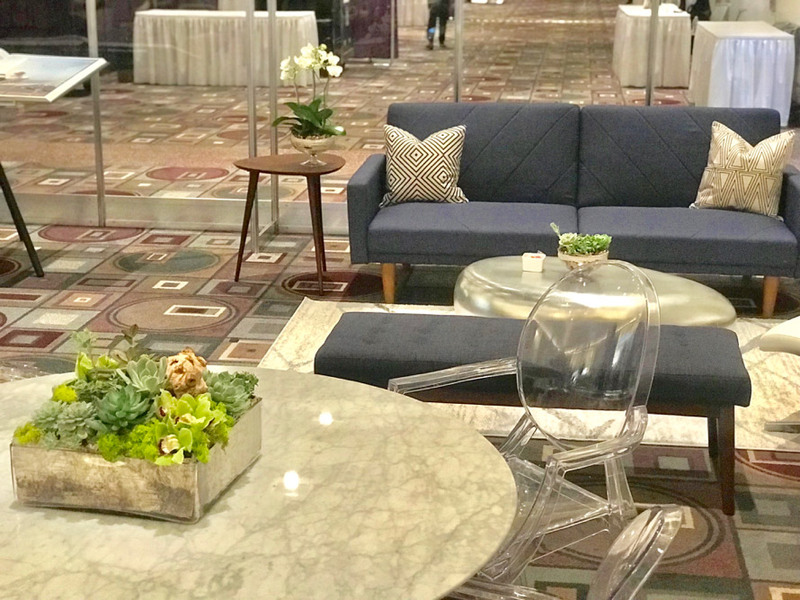 Décor has evolved into a facility support contractor, primarily for the federal government, that offers interior design, tenant improvement and custodial and grounds maintenance services. Today, Décor Interior Design, Inc. has more than 20 employees, 30 sub-contractors, and has completed projects in eight states. Décor’s services and products seamlessly transition from design specification to installation and upkeep. Part of Décor’s growth strategy is participation in the SBA’s 8(a) program. Access to federal contracts and impeccable past performance has grown her company tremendously. The company’s revenue climbed from $335,853 in 2009 to more than $1.1 million projected in 2013, an increase of over 325 percent. Expanding Décor’s offering to include specialty construction, custodial services, and facility maintenance. Recognized as a leader in the community, Ronda was nominated for the Women Making a Difference Award in 2013 by the Los Angeles Business Journal and served on the board for the Los Angeles Chapter of the American Society of Interior Designers as Professional Development Director. Ronda, a NCIDQ certified and a professional member of the American Society of Interior Designers, studied at the University of California Los Angeles in Interior and Environmental Design. Ronda was also a featured designer on HGTV’s “Designer’s Challenge.” The charismatic and dynamic entrepreneur has hurdled obstacles throughout her entire career. Her business model has evolved over the years but one thing has not changed: her firm belief in helping clients, employees, and colleagues achieve their best. She has always focused on listening and working closely to realize the balance of what they want, when they need it, and how she can be of service. We all start businesses for many reasons: We are good at something; someone told us we are good at something or you had no other options. My steps from solopreneur to federal contractor were closer to the latter. The journey is rocky, reckless and only until recent, rewarding. After 15 years in business, I was awarded my first seven-figure contract from the federal government in 2012. Now, before you cheer or congratulate me learn from my mistakes. Federal contracting is inundated with what seems to be redundant paperwork and a laundry list of acronyms not found in Webster’s Dictionary. Even if you think you are ready, you are not ready. The faint of heart would welcome a cubicle and coffee mug to the daunting task of bidding on a federal project. The competition is the least of your worries. They are in the same boat. Being the proud business owner I am, I treaded along with no guidance or assistance. I bumbled through the application with more requests for clarifications than questions on the original application. There are free and low-cost resources to help you. Services range from business development, government contracting, and financing. One resource that was very helpful was the Small Business Administration. Not only did I get help with government contracting, I was also able to acquire several socio-economic certifications including the 8(a). There is a new commodity in my company’s portfolio…the SBA. With that I submitted the bid. Now, on paper I have promised I can do an insurmountable amount of work in an unrealistic amount of time for a bargain-basement-blue-plate-special-price. And at the end of the day pay employees, rent, and hopefully myself. Are you sweating? I was. Did you know that any business problem you are having there is someone else who’s had it and survived? I welcomed enrollment in the Goldman Sachs 10,000 Small Business Program. The challenges of product, process, prospects and profitability were tackled head on. My prayers were answered. After graduating from the third cohort at Los Angeles City College, I was able to clearly define my services and help my client recognize my value. I ultimately negotiated a fair price for all parties and was awarded the contract. This is the part of the day where I close my eyes and picture everything I want for my business; our new office, multi-millions dollar contracts, and family vacations. With my eyes closed everything seems within reach. But, who can run a business with their eyes closed? Like the old Proverb, “give a man a fish and you feed him for a day. Teach a man to fish and you feed him for a lifetime,” we need to constantly retool and rethink our business strategies. My business practices from 15 years ago were adolescent and no match for the US government. Tapping into the business resources available in most metropolises opens your eyes to the growth potential of your company. As you follow rules one and two to steadily grow your business, keep careful watch on not only the product or service you provide, but also creating an arsenal of resources and increase your growth exponentially. Be vigilant, ask questions, get help. This blogger graduated from Goldman Sach’s 10,000 Small Businesses program. The Goldman Sachs Foundation is a partner of the What Is Working: Small Businesses section.